She had a noted turn-of-the-century career in both America and Europe. Born Fanny Martina Simonsen to an operatic family, she was raised in Australia from an early age and taught to sing by her mother. 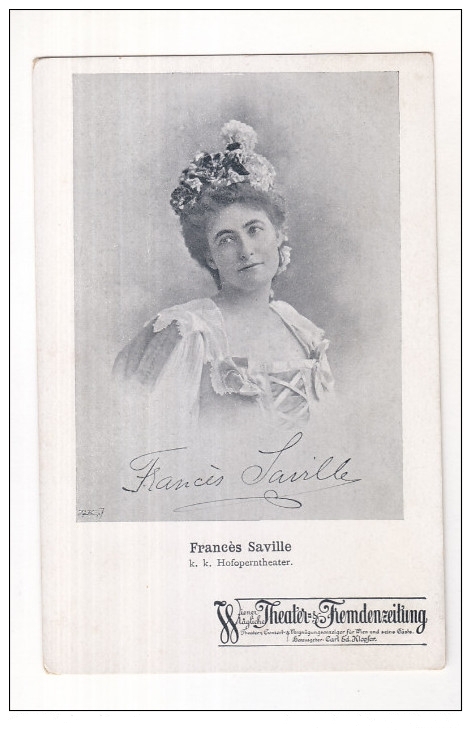 Taking the name "Saville" from a brief early marriage to her father's secretary, she first sang in public at an 1882 presentation of Michael Balfe's "Satanella" then in the late 1880s had a busy recital career in Sydney and Melbourne before departing for Paris to study with mezzo soprano Mathilde Marchesi; Fanny made her 'formal' operatic debut on September 8, 1892, at La Monnaie, Brussels, as the tragic title heroine of Charles Gounod's "Romeo et Juliette". She soon took-on the role of Marguerite from the same composer's "Faust" and then appeared in Russia,Berlin, and Warsaw, along the way enhancing her repertoire with Violetta of Verdi's "La Traviata" and the doomed title lead of Donizetti's "Lucia di Lammermoor". Fanny added two of Verdi's 'heavyweight' parts, Leonora in "Il Trovatore" and Desdemona from "Otello", which she sang in Monte Carlo opposite Tamagno, to her list before returning to America for her November 18, 1895, Metropolitan Opera debut as Juliette. While in New York her assignments included Violetta, Micaela in Georges Bizet's "Carmen", Elsa of Wagner's "Lohengrin", Zerlina from Mozart's "Don Giovanni", the lead heroine of Jules Massenet's "Manon", Gutrune from Wagner's "Gotterdammerung" and Alice Ford of Verdi's "Falstaff"; begining in 1898 Fanny was a regular at the Vienna Court Opera (then, Hofoper) where she became a favorite of music director Gustav Mahler. For awhile she divided her time between New York and Vienna but by 1903 she was rich and retired to Vienna after giving her final performance on May 9th. in Prague as Violetta. Forced from Austria by the onset of World War I she lived in Australia for a time before relocating toNorthern California where ill health relegated her to a nursing facility in her final years.